A Master of unarmed combat wants you to try to hurt him to prove you deserve his training. Hand to Hand skill of 70. Speak with Davela Hlaren in the Imperial Bridge Inn or Ra'qanar in Castle Cheydinhal to receive the master trainer recommendation. Reduce Helvius Cecia's health by half to prove you deserve his training. 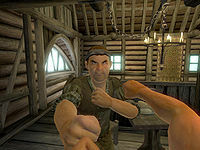 Once you have achieved a Hand to Hand skill of 70, head to the Imperial Bridge Inn, located east of the Yellow Road, to speak with Davela Hlaren, or to Cheydinhal to speak with Ra'qanar, to learn that if you wish to learn more about Hand to Hand combat you need to find Helvius Cecia, a Thieves Guild member who resides in Bruma. Before providing master training, Helvius will require you to prove that you have the skill to fight bare-knuckled. You must un-equip any weapons, and do over 73 damage to him in under 40 seconds (his health is 163, and you need to get it down to 90). Technically, you should attack Helvius with your fists but he won't be upset if you use spells, although this will completely defeat the purpose of the test. Draw a weapon, or take too long, and he will call off the fight and say you're not ready. Once you accomplish this, Helvius will agree to train you for a fee. If you are having trouble passing the test, turning down the difficulty slider will increase the damage you do. Alternatively, a Fortify Strength potion/spell/enchantment could prove rather useful. Do not have any followers with you when you start the training, as they will engage in combat with Helvius when the fight begins. During Turning a Blind Eye bug Helvius Cecia will be waiting outside his house while it is being "borrowed". He will still offer the master training exam, but you risk interference from the guards if they see the two of you fighting. You can use Command Humanoid on him and lead him back into his house, however, this will significantly reduce his disposition to you, and he may attack you because of his low disposition. If you have a Calm spell with you, you can use that to then raise his disposition onceyou bring him back into his house. 10 I need to speak with Helvius Cecia in Bruma about training hand to hand combat. 20 I must prove my worthiness to Helvius Cecia before he will consider training me. He's asked that I hit him as hard as I can. 100 Finishes quest Helvius Cecia has agreed to train me. 200 Finishes quest Helvius Cecia is dead. I have no chance to be taught more about Hand to Hand combat now. It is possible to use the console to advance through the quest by entering setstage TrainingHandtoHand stage, where stage is the number of the stage you wish to complete. It is not possible to un-complete (i.e. go back) quest stages. See SetStage for more information.